Why book Munich Airport car rental at VIP Cars? Rent a car at Munich Airport with pricing inclusive of CDW, Theft Waiver, Unlimited Mileage etc. Book the best car rental deals for Munich Airport MUC now! One of the most modern and interesting cities in Germany, Munich welcomes thousands of tourists every year. A good way to discover this lively city on your trip is by driving around and exploring the different places on your own time and pace. Pre-book a car rental with VIP Cars for Munich if you’re entering the city via the Munich Airport and your vehicle will be waiting for you when you land, saving precious time. On top of saving time, you also get to avail huge discounts on booking a car in advance. How to book a car rental for MUC Airport with VIP Cars?? Enter the details of your Munich trip and the search engine will present a list of all available rental vehicles at Munich Airport by different suppliers. Browse through the various vehicles and car rental deals available, narrowing down your options by using multiple filters on the side. Secure the rental car of your preference by paying a small amount online and a rental voucher will be sent to you via email to confirm your booking. VIPCars works hand in hand with all these car suppliers to secure its customers the best MUC car hire deals at cheapest possible prices. Our suppliers often have their offices at multiple locations in a city and thus a customer can also drop off the rental vehicle at a different location even when the Pick-Up is Munich Airport; a different drop-off confirmation can be easily cross checked with support team or supplier. The supplier may or may not charge extra for the change of location, depending upon different factors. Competitive prices due to high competition. Highly secure online payments system. Standard insurances and taxes included in the final price, no hidden charges. 24x7 booking support - online and on the phone. Add-ons like navigation systems and child seats for added comfort. Pre-booking a car rental saves time at the airport. Provision for snow tires in the winter season. Children under the age of 12 should be seated in appropriate child seats. In the winter season, it is mandatory to drive your car with special winter tyres. Trailers are allowed to move at a speed of 80 km/h on roads. All vehicles with snow chains have a speed limit of 50 km/h. Always carry your driver’s licence and car rental papers while driving. Munich International Airport is one of the busiest airports in Europe. The airport has two terminals, two runways and a helipad, and handles 39 million passengers on average yearly. The airport has all the services and facilities of a major high-end airport and is fully accessible to passengers with physical disabilities. Munich International Airport is located 28 km north-east of Munich and is one of the busiest airports in Europe. The airport has a 'Visitors Park’ with a 'Visitors Hill’ that gives a stunning view of the Westerly Aircraft Apron, and a 'Visitors Viewing Area’ in Terminal 2 that gives a view of the Easterly Aircraft Apron. Banks, ATMs and bureaux de change in both terminals. There are 30,000 parking spaces at the airport, more than half of which are covered. Free Wi-Fi is available throughout the airport, along with payphones and a post office. Prayer rooms, resting rooms, cloakrooms, children’s area and baby care facilities. Pharmacy, emergency medical centre and a dentist office. Shops at Munich Airport are one of the leading hotspots of Munich City. With so much to explore here in terms of lifestyle goods, fashion accessories, jewelry, beauty products, and confectionery items, an experience of a lifetime awaits you. For all those searching for something antique, the below-mentioned shops stand true to their reputation of selling unique products. The store is famous for its massive range of toys, souvenirs, and miniature airplane models. 9:30 a.m. - 5:00 a.m. Chef's Tools is known for its extensive range of cooking equipment and top-quality ingredients. The shop is well-known for its collection of toys, models, and games for science and technology. The shopping store is famous for gingerbread hearts, white sausages, toys, and traditional clothing. Explore the world famous fragrance brands at the following exclusive stores that offer great deals on perfumes and cosmetic products. The boutique offers a huge collection of cosmetic products for all the age groups. The shopping outlet is known for perfumes, candles, and a variety of bath salts. A full-fledged pharmacy offering a variety of hair and skin care products for all the age groups. The Italian store is distinguished for its customized products, and face and body treatments. Check out the world's hottest fashion brands at Munich Airport. With plenty of exciting offers available, you can buy more by paying less. The store is known for its Italian tailoring and high-quality garments for men of all age groups. The shopping outlet is famous for its collection of designer and business bags, and luggage. The fan shop offers a huge collection of club shorts, jerseys, socks, and other memorabilia. Renowned for its extensive range of shoes, bags, perfumes, leather goods, and other articles. Check out some of the world's most iconic luxury watches and jewelry brands at Munich Airport. The following stores attract travelers in large numbers. The store is known for its fine collection of watches, pens, leather goods, jewelry, and accessories. 6:00 a.m. - 9:15 p.m. The boutique is famous for its designer spectacle frames, leather items, watches, jewelry, and bags. The multi-brand store features Cartier, Omega, Rolex, Chopard, Jaeger-LeCoultre, and many more. Offers a wider selection of luxury watches, sunglasses, and other high-quality accessories. Enjoy shopping at the below-mentioned duty-free merchandise stores that offer irresistible prices on thousands of products, ranging from electronic goods to liquor and apparels. Shopping store offers a great collection of chocolates, toys, cosmetics, perfumes, and wines. The duty-free retail outlet features a huge assortment of chocolates, fragrances, and spirits. Explore a wide range of culinary options at Munich Airport. Whether you want a light snack, breakfast, lunch, dinner, or simply a cup of coffee, you'll find everything at the following food joints. Offers a great collection of freshly baked bread, rolls, snacks, and loaf items. Offers a variety of fast food options with an integrated McCafe lounge inside. Lets you select from a large selection of sandwiches, chips, soft drinks, and cookies. Famous for its red/white curry sausages, a variety of soft drinks, and regional beers. 10:00 a.m. - 9:30 a.m. Waiting for your flight has never been so comfier at Munich Airport. You can relax at any of the given below lounges that offer all the latest amenities to indulge in. What to do at Munich Airport? Don't let an extended layover at Munich Airport dampen your spirits. We present you with some exciting options that you can try during your stay at the airport. The only airport brewery in Europe lets you taste different types of beers along with meals. Allows you to play any of your favorite casino games amid comfortable club settings. Full of small toys, rides, and ample space, the Children’s Area assures of a great time for kids. Read a book, make a phone call, or simply sit idle at the relaxation zones for airport travelers. Besides enjoying the captivating views of the airport, you can learn something new at the exhibition. Famous for Visitors Hill, interactive exhibits, and close-up looks of jumbo jets at the airport. 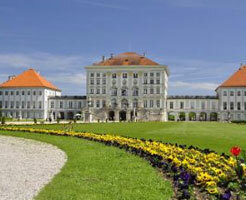 A Baroque Palace in Munich with a rich history and museums to keep the tourists busy. 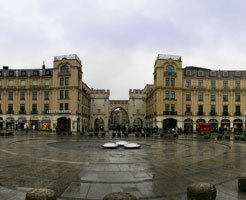 A large square in Central Munich with a number of important buildings that keep the place crowded. A huge public urban park in Munich, it is one of the largest in Europe and contains many beautiful places of attractions. 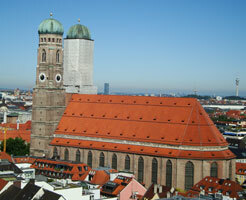 The most prominent cathedral and landmark in Munich, the church towers hold great architectural significance. Embark on a day trip in your MUC Airport car rental with sheer ease. As Munich is closer to several worth seeing places, you can reach your preferred destination in no time. 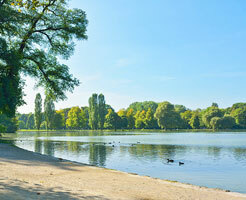 We present you with the names of 5 most visited day trip destinations from Munich. Salzburg, a captivating Austrian city, is just 2 hours away from Munich. A perfect spot to spend your day, Salzburg is known for its Mozart, a beautiful castle, and the imposing Hohensalzburg Fortress. Be it's cobblestone streets or highly regarded shopping places, Linzer Gasse and Getreidegasse, Salzburg packs in all the excitement that you can think of. One of the most visited sites in Germany's Bavarian region, Fussen is known for Neuschwanstein Castle, a fairy tale home of the Mad King Ludwig II of Bavaria. Situated just outside the town, the castle attracts tourists round the year. Factor in more time if you want to get inside the Neuschwanstein Castle as tourists are required to hire a guide for visiting the fort. Settled on the banks of the Lake Constance, Lindau is a classic medieval town and a perfect day trip destination from Munich. As the lake shares its borders with Switzerland and Austria, you can enjoy a boat ride to other country as well! Besides its paradisaical landscape, Lindau is known for its delicious pastries and cakes that are readily available at cafes and bakeries. Another picturesque destination that you can easily reach from Munich in less than 2.5 hours is Rothenburg ob der Tauber, a truly fascinating place. Preserving its historical heritage that dates back to the 10th century, Rothenburg features old city walls and fortifications. Walk toward the Old Market Square to delve deeper into the city's atmosphere. While shopping is not on everybody's holiday radar, but for those who really wish to go on a buying spree during their stay at Munich, there could be no better place than Ingolstadt. With some of the best brands, including Calvin Klein, Versace, Armani, and Fossil, operating their factory outlets at Ingolstadt, you can save up to 50%-60% on cosmetics, home ware, and fashion merchandise. Is a credit card necessary to book a car rental? Yes, the renter needs to book their car rental with a credit card in their name and it is important to present the same at the time of the pickup. VIP Cars accepts all major credit cards. How much do I have to pay for a security deposit? The amount of the security deposit entirely depends on the supplier and the category of the vehicle that you are renting. The exact amount can be seen under the 'rate details’ section at the time of booking the car rental for Munich Airport. How can I reach my supplier? All the details and information about the supplier you rented the car from is mentioned in the car rental confirmation voucher, and you can contact the supplier accordingly. If you are not able to get in touch with the supplier, you may contact our support team. What are the inclusions in my car rental for Munich Airport? The specific inclusions in your car rental deal depend on the supplier you rent the car with, but usually the deals include airport surcharge, unlimited mileage, collision damage waiver, theft waiver, third party liability insurance, taxes and fees.